Signed ll: "Wm. 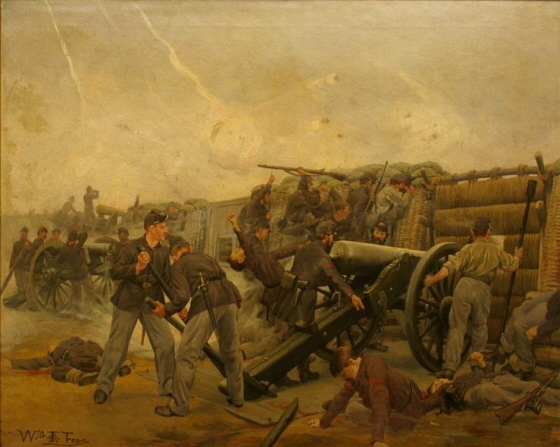 T. Trego"
This was one of seven works commissioned by publisher George Barrie as illustrations for his monumental work The Army and Navy of the United States, published in Philadelphia, 1889–95. It was reproduced in section 6 as a 7½-by-6-inch black-and-white photogravure. A study for the figure pulling on the cannon wheel can be seen in a photo taken in Trego’s studio in 1901. Purchased by the previous owner in October 1975, it was sold at Heritage Auctions in Dallas, TX, December 8, 2012, Lot 52110, for $17,000.